Because of frequent and heavy rain, corn planting in Missouri has been much slower this year than last year. But, last year was an odd year in nearly every way, including unusually warm and dry March weather. For many reasons, we ought to put 2012 in our rear view mirror and not look back for much help in making crop management decisions. For example, 37% of Missouri’s corn acreage was planted by April 14, 2012. Short term normal (5 years) was only 17%, and nearly all of that 17% occurs in the southern part of our state. This year, Missouri’s corn planting progress is 8% - slower than normal, but no reason for alarm, yet. Figure 1 presents the effect of planting date on corn yield for mid-Missouri. Data are averaged over five years and at least four hybrids in each year. Our data indicate, on average, little difference in yield potential for planting dates in April. From May 1 to June 1 corn yields decrease about 25%. Figure 1. Effect of planting date on corn yield in mid-Missouri. As you might guess, differences occur among years for response of corn yield to planting date. Weather conditions in July and early August affect corn yield far more than planting date and weather during those weeks can mask the effect of planting date. For this reason, it is difficult to predict in any specific year what will happen to corn yield if planting is delayed. However, on average, corn yield potential declines during May, first slowly, but then at an increasing rate toward the end of the month. The costs and benefits of switching corn acreage to another crop such as soybean vary among farmers and fields. Each farmer must make the decisions for which he/she is comfortable. 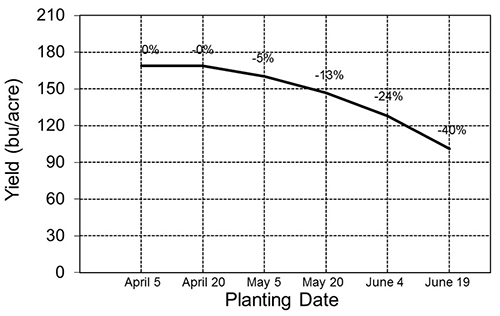 But, our data indicate that switching out of corn may not be wise even if planting is delayed until the end of May. Although not part of the data in Figure 1, it may not make sense to switch corn maturities, either. We found that corn hybrids with CRM of 110 out yielded corn hybrids with CRM of 100 until the first week of June. Early maturing hybrids are short, have shorter kernel-filling periods, and should be planted at greater seeding rates. We understand that drying costs are important, and our data focuses solely on yield comparisons. Our data provide some optimism that reasonably high yield can be obtained when corn is planted in mid to late May. However, yield potential is very strongly dependent on weather conditions in summer. The ability for corn to maintain yield in years with dry weather is strongly related to the health of the root system. While it is understandable that planting may begin too soon as soils begin to dry, planting and other traffic on wet soils lead to soil compaction. Soil compaction reduces root growth and may result in increased disease incidence. So, once soil has begun to dry, patience is needed so that harm to developing corn roots is minimized.